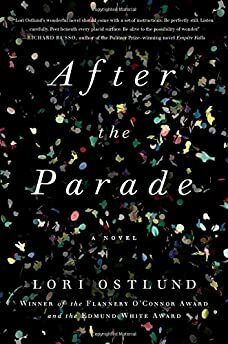 Largehearted Boy: Book Notes - ﻿Lori Ostlund "After the Parade"
Book Notes - ﻿Lori Ostlund "After the Parade"
Insightful and written in precise prose, Lori Ostlund's After the Parade is a remarkable debut novel that resonates with the clarity of her estimable short stories. "An example of realism in its most potent iteration: not a neatly arranged plot orchestrated by an authorial god but an authentic, empathetic representation of life as it truly is." I don't listen to music when I write, especially not music with words, nor can I write if there are people in the same room or even—increasingly this seems to be the case—people in nearby rooms. I used to be able to write in a study with a window, but eventually the world outside proved too distracting, which is why I spent the summer of 2013 piecing together the many parts of After the Parade in our basement garage, a room technically with a window, though that window looks into the garage proper and offers a view of garbage cans. Despite my need to write in a vacuum, I do my best thinking about writing to music. I might get in the car and drive while listening to Bob Dylan or Pink Martini, cook with my computer shuffling through Willie Nelson, Aretha Franklin, and the Violent Femmes, or attend a concert at the San Francisco Jazz Center. Thus, while the book was not written to music, it most certainly was created to music. "99 Luftballons," Nena (the German version): My partner (okay, wife) hates this song, which I insist on playing at the start of every long car trip. This means that we begin every road trip with an argument, but the song never fails to energize me and make me well disposed toward the day ahead. After the Parade begins with a departure: Aaron, the main character, gets into a U-Haul and leaves his partner of 20+ years in the middle of the night. I listened to Nena often during the course of writing this book, though, in truth, I do not think that Aaron would listen to "99 Luftballons" as he drives away, for I don't think that he's in the mood for buoyed spirits. Aaron is moving to California, so Led Zeppelin's "Going to California" is also a possibility, for Aaron most certainly is "going to California with an aching in [his] heart." Moreover, he and I are the same age, born in 1965; Led Zeppelin figured heavily in my youth, though perhaps not his. I'm not a huge Zeppelin fan, though I do associate them with driving. Nearly every time I drive across all or part of this country, I've hit stretches where the only (tolerable) stations are those that play Led Zeppelin and similar 70s bands, stations that feel very male to me, yet also leave me nostalgic. I don't think that these stations would appeal to Aaron. Later in the book, he makes another long drive, from Minnesota to Needles, California, stopping along the way in North Platte, Nebraska, where I have spent the night several times and where I always encounter these 70s-rock stations. Still, while "Going to California" fits what is happening as the book opens and is a song for which I have a soft spot, I don't think that it fits the mood in the U-Haul as Aaron leaves Albuquerque and begins driving west on I-40. I think that Aaron's mood that morning might best be represented by Johnny Cash's "Sunday Morning Sidewalk" or Nina Simone's version of "Mr. Bojangles," both of which are songs that I listen to when I am in a certain melancholic state. They both speak to me of loneliness, and loneliness is one of the book's main themes. "Sunday Morning Sidewalk": From 1998 to 2005, my partner (wife) and I owned an Asian furniture store in Albuquerque, New Mexico, and each Sunday morning as we opened the store, we listened to Johnny Cash. When Aaron leaves his partner, they have been living in Albuquerque for nine years, and each Friday, he eats lunch (in secret) at Milton's, a diner on Central Avenue that is no longer there but that was a mainstay of my life in Albuquerque, particularly when I was in graduate school and broke. It was open 24-hours/day, and I could get a chorizo breakfast burrito with hash browns and green chile for $3.50. Central Avenue used to be part of Route 66, so up and down it are roadside motels that have seen better days. In the book, Aaron goes to the diner and observes, with fascination, the men who live in these motels and eat at the diner, lonely men who live solitary lives. Our store was situated along a different stretch of Central but amid the same kinds of motels, which attracted the same type of men, some of whom would come over to our store to talk and help with odd jobs. We referred to them as the Sunday Morning Sidewalkers. "Mr. Bojangles," especially Nina Simone's version, is another song that beautifully captures a life of loneliness. In the novel, Aaron is a lonely man who has spent his life listening to the stories of other lonely people, and when I listen to this song, I always feel heartbroken when the dog, his one friend, "up and dies." "Skyway," The Replacements: About half of the book is set in Minnesota, where I spent the first twenty-three years of my life, and when I think about songs that feel distinctly Minnesotan to me, this is one of them. If you've ever spent time in downtown Minneapolis, you know the skyways, which are walkways over the streets that connect buildings so that people don't need to go out into the cold: "You take the skyway, high above the busy little one-way/In my stupid hat and gloves…"
I'm not going to lie: I love this song, which I listened to a lot in graduate school because the dive bar that I hung out at, Jack's (also located on Central Avenue amid those flophouse motels), had it on the jukebox. There's a tentative hopefulness about it that appeals to me: "Guess you feel you'll always be the one and only one for me/And if you think you could/Well, chances are your chances are awfully good." Dvorak's New World Symphony is, I think, the only song actually mentioned by name in the book. Aaron goes to the symphony one afternoon, arrives early, and sits down in the Civic Center Plaza to kill time. There, he sees a group of young, homeless people with a razor, shaving one another's underarms, and is both shocked and touched by the intimacy. At the time that I wrote that section, I had just attended a performance of New World Symphony, and the next day I put in a Dvorak CD and listened to it while I was writing, the only time I recall writing to music. I should say that I know very little about classical music, so when I listen to it, I respond on an emotional (as opposed to intellectual) level. In fact, I think that the reason I don't listen to music when I write (even songs without words) is that I write best when my own emotions are even, and when I listen to music, my emotions are rarely even.